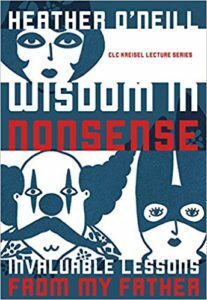 Heather O’Neill’s Wisdom in Nonsense: Invaluable Lessons from My Father begins with a piece of fatherly advice that must have sounded, to the young budding writer, as a challenge: “Lesson One, Never Keep a Diary”(3). O’Neill tells us that while chronicling the daily events of her life made it “seem worthy of a novel,” she suspects that it made her father, Buddy, feel “as though he were under surveillance”—the diaries could house unseemly information which could be used against him by a court, or by O’Neill herself later in life, to judge him. The lesson, of course, did not stick: “no matter how many journals he threw out, I would continue to write in them. I’m writing in one now” (3). Taking us into a cheeky “meta” moment of the eternal “now” in which O’Neill will forever defy her father’s advice, Wisdom in Nonsense offers up a selection of life lessons given to O’Neill as a child which come to act not as hard-and-fast rules but as guideposts to an occasionally odd-ball yet always sincere process of reflection on childhood, writing, and the father-daughter bond. Originally delivered as part of the CLC Kreisel Lecture Series, which aims to highlight the different specificities of the contemporary Canadian experience and act as a critical forum dedicated to Canadian literature, this slim volume contains thirteen lessons over forty pages and would be most enjoyable for the more devoted fans of O’Neill’s work, who will appreciate it as a companion piece to her fiction as well as to her earlier work of poetry, two eyes are you sleeping. Fatherhood and father-daughter relationships are, of course, common themes in her work, from Baby’s drug-addicted father Jules in Lullabies for Little Criminals to Etienne Tremblay, the fallen folksinger and absent-father of twins Nicolas and Nouschka in The Girl Who Was Saturday Night. Familiar too is the backdrop of the Montreal underworld, with its petty crime and spectacles of urban eccentricity placed alongside a sort of impoverished domesticity—the world of O’Neill’s childhood—which here has moments of magic created by Buddy O’Neill’s persistent attention to mood, such as when he turns off the lights to enjoy a fondue dinner because he thought “you could only eat fondue in the dark, as though it were a campfire to scare away minuscule wolves” (21). Reading about her connection with her father and the way in which they lived on the margins of society comes to illuminate O’Neill’s ability to depict the strange, perhaps even unexpected beauty of such bonds in her fiction. Not to suggest that O’Neill’s fiction should be read biographically, but rather that her experiences of an atypical father-daughter relationship informs her writing. 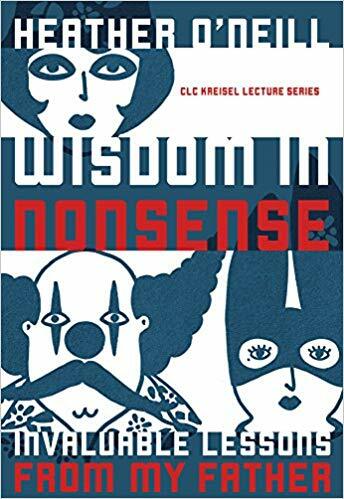 For instance, as mirrored by Baby’s mothering of Jules in Lullabies, in Wisdom in Nonsense there is a recognition of a mutual dependency that can develop in close familial relationships. O’Neill stresses how much her father wanted her to love him, which he admittedly expressed in odd ways, such as requiring her to never watch a Paul Newman movie (Lesson Twelve) because he wanted her to think he could’ve been a better actor than Newman if he had been given the chance. As much as O’Neill inevitably breaks all of the lessons given to her by her father—she does watch and enjoy a Paul Newman movie though has “never tried his salad dressing out of respect for [her] father” (33)—interesting moments emerge as her reflections on her father allow her to simultaneously reflect on her development as a writer. We get to trace, as it were, the influence of a legendary Montreal gangster on the child who would go on to become one of the most popular writers in contemporary Canadian literature. This experience is revelatory of the creation of her signature mythos, so to speak—that imagined cityscape in which it becomes logical for cats to wear bowties and disappear into mirrors, and where drug-addled pontificating becomes valued as philosophy and any object becomes worthy of a museum if you cherish it enough. Lesson Eleven, “It’s the Thought That Counts,” for instance, begins with an image of unsigned birthday cheques collected in a vinyl wallet hidden in an underwear drawer, waiting for the day that Buddy has the funds to sign them. As a child O’Neill knew that her father wanted to give her as much as he could, even if it wasn’t feasible. This lesson then opens up to her love for the Anne of Green Gables series, books given to her by her father, and her “desperate, wild, brave, obsessive manner” of reading which led to the creation of “an odd aesthetic that incorporated [her] childhood reality and the high art of literary fiction” (28, 29). O’Neill similarly reflects on her father’s friends—a group of homeless men, drug addicts, and ex-cons—whose very existence seems to have had a role in the formation of the author’s celebrated creativity and empathy, as she wonders: “Was it because I read a lot as a kid that I had the literary skills to appreciate these characters? Or was it those characters who caused me to read in a different way? It was probably an intersection of both” (20-21). Ironically, though she may not have followed his rules, O’Neill has fulfilled her father’s hope that she record his life advice to share with others, “The Pensées of Buddy O’Neill” as he terms it (29). And while Wisdom in Nonsense may not act as “the foundation of a universal school of thought” as her father had intended, it remains, above all else, a humorous and touching elegy to Buddy O’Neill. Erin Della Mattia is a writer and doctoral student in the English Department at the University of Toronto. She is also the managing editor of Sewer Lid, an online journal of urban art and literature. This entry was posted in All Reviews, Book Reviews, Non-Fiction. Bookmark the permalink. Both comments and trackbacks are currently closed.